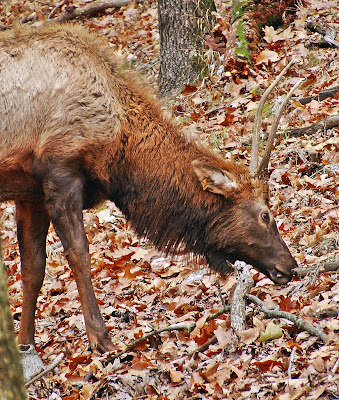 LONE ELK PARK in Saint Louis County, Missouri, got its name from the single elk that was in residence here many decades ago, but now the park has a sizable herd of these creatures. This area was part of an ammunition testing range during the Second World War, and many interesting concrete structures still dot the landscape. The photos here aren't too good, since I did not use a tripod. 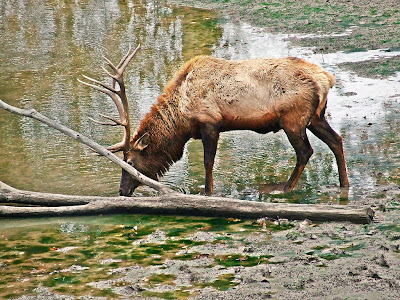 The Elk (Cervus canadensis) was at one time native to Missouri. 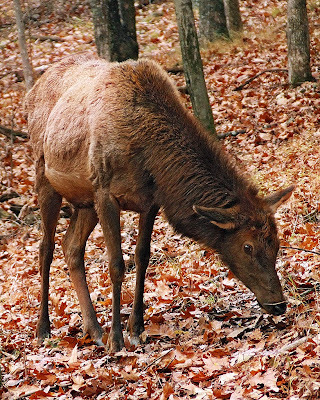 Although the state has excellent habitat for this animal, there are no plans to reintroduce these to the wild, due to the danger of car-elk collisions. Adults weigh around 500 to 700 pounds. 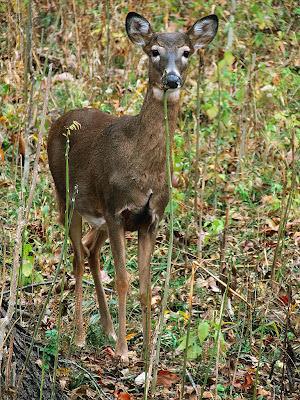 This species is found throughout North America and East Asia, and was believed until recently to be the same species as the Red Deer found in Europe. It is the second largest species of deer, the largest being the moose, which confusingly are called elk in Europe. 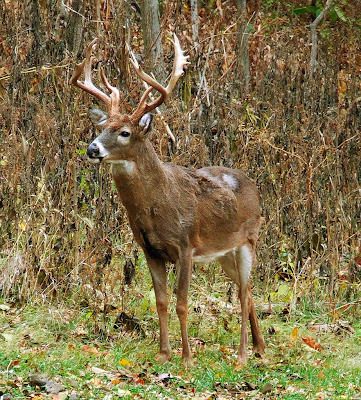 This trophy buck is a Whitetail Deer (Odocoileus virginianus), a flourishing species native to Missouri, found in every county, including occasionally in the City of Saint Louis. 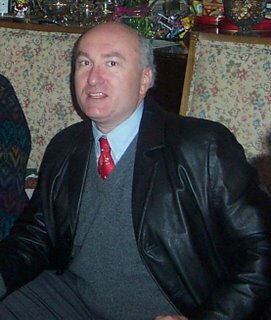 The species is found in the Western Hemisphere from Canada to Peru. 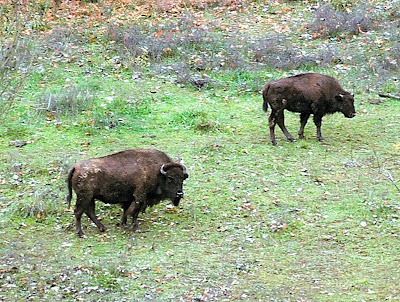 We call these buffalo, but their Latin name is Bison bison. Although herbivorous, these are the most dangerous beasts in North America. They appear to be lethargic, but can run quickly and jump high obstacles when provoked. 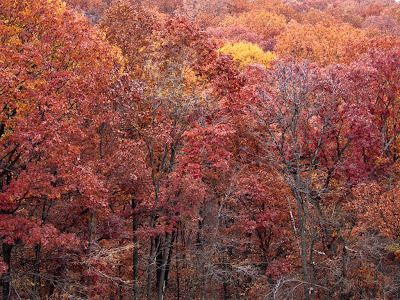 At one time, these were native to Missouri, and used to spend the winter in the sheltered valleys of the Ozarks. 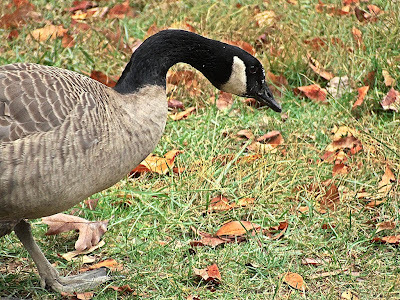 A Canadian Goose (Branta canadensis), one of zillions living in the state. 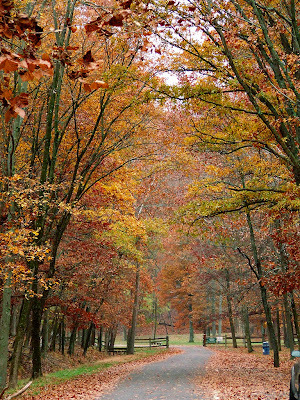 The fall colors here are spectacular. Trees here are oaks, mainly with red and orange leaves, and some maples with yellow leaves. This tower was used as a platform for test firing .50-caliber machine gun ammunition. Now, it provides a nice view of the lake and valley below it. 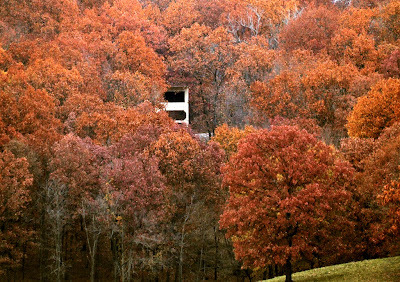 The park is set in the Crescent Hills, which are sometimes called the "foothills of the Ozarks", for they are the first mountainous wilderness seen when driving out of Saint Louis along Interstate 44. The ridge tops in this area contain thousands of chert quarries, used since the remotest of antiquity by the Indians for making flint arrowheads and knives; this flint was a common trade good and is found scattered about North America. Incredible. 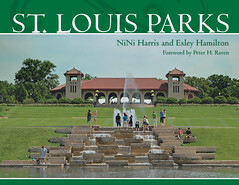 How could I learn more about St. Louis' history, geography,and the Indians that once lived here? Ah ha! Great pictures. Second year here in the south that this northerner has missed the color changes. And of course my extended geese family ha ha. 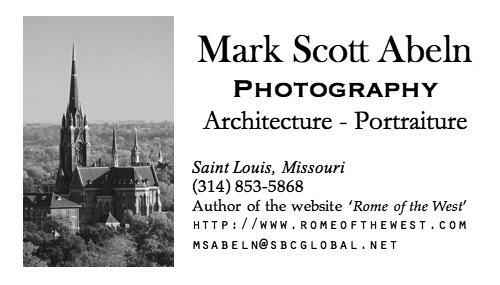 You can start finding links to websites on Missouri history here: History of Missouri. 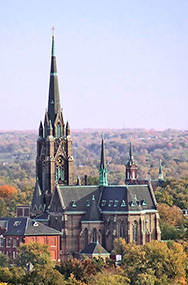 A brief Catholic history is here. Some links to American Indian history of this area are here.